The former Hibernian and Crystal Palace stopper was released by the Woodside Road outfit earlier this week following Lucas Covolan’s return to fitness. 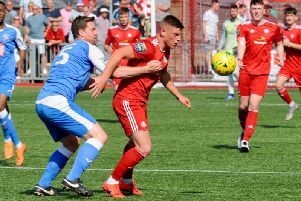 Perntreou was named on the bench in Worthing’s Bostik League Premier Division clash at Bognor on Saturday, with Covolan handed his first competitive start since October after recovering from a broken arm. Worthing manager Adam Hinshelwood thanked the departing stopper for his services to the club but admitted it was impossible to keep the pair. He said: “Kleton has been released and I believe he’s looking for other clubs. “The case was made clear to him and his agent that we could offer him game time until Lucas was back. Perntreou racked up 29 club appearances after his debut in the club’s FA Cup defeat at Ebbsfleet United in October.